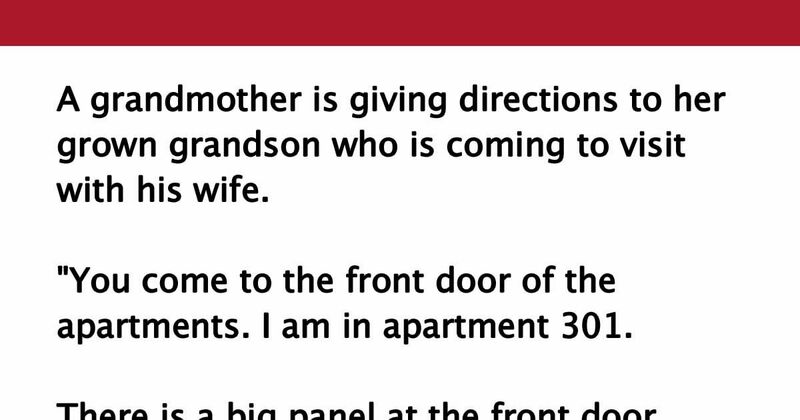 A grandmother is giving directions to her grown grandson who is coming to visit with his wife. "You come to the front door of the apartments. I am in apartment 301. There is a big panel at the front door. With your elbow, push button 301. I buzz you in. The elevator is on the right. Get in, and with your elbow, push 3rd floor. When you get out, I'm on the left. With your elbow, hit my doorbell. Kapish?" "Grandma, that sounds easy," her grandson replies on the phone, "but why am I hitting all these buttons with my elbow?"